Good news! Fourerr is growing – and that means we’ve been refining our systems, getting feedback, streamling our processing and improving upon existing designs. We realize that getting the help you need in an organized and timely fashion can make or break your decision to work with a given company, web platform, or seller. Fourerr is customer-centric and focuses upon setting the bar higher in the world of online job sites: we’ve raised the stakes on how we connect our buyers and sellers with the help they need. We now offer a state-of-the-art ticket system that streamlines the help support system. When you submit a ticket, you get a unique number to ensure that you get the personalized support you deserve as a Fourerr member, every step of the way. With your ticket number, you can track the progress and related responses to your query right online. We provide you with complete archives and history of all your support requests – so that you are always kept in the loop. Bottom line? A ticket system just makes sense for a platform of Fourerr’s caliber. There are core questions in any organization that come up, time and time again. We’ve identified what these questions are in Fourerr so that you can have easy access to the answers you need – when you need them. 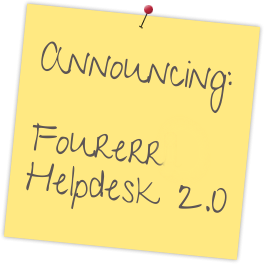 From questions about signing up to getting paid, the Fourerr knowledge base at the help desk is your go-to resource for immediate answers. For questions that don’t have an immediate answer, just initiate a ticket request to get personalized help. Fourerr isn’t just about buying and selling micro-gigs – it’s a place for skilled workers and entrepreneurs to connect and share. Our new community forums are here for you: ask questions, spark conversations, connect with other Fourerr community members, share ideas and get inspired. Fourerr is about you, and it’s for you. We are dedicated to improving the way the world works and creates. Our brand new help desk is a way for you to get the answers you need so you can grow the success you want.